Heat oven to 375°F. Spray 12x8-inch (2-quart) glass baking dish with nonstick cooking spray. In sprayed baking dish, combine rice and broth; mix well. Cover with foil. Bake at 375°F. for 45 minutes. Remove rice from oven; uncover. Add pineapple with liquid, bell pepper, carrot, cashews and ginger; mix well. Place chicken over rice mixture; press slightly into rice. Brush chicken with teriyaki baste and glaze. 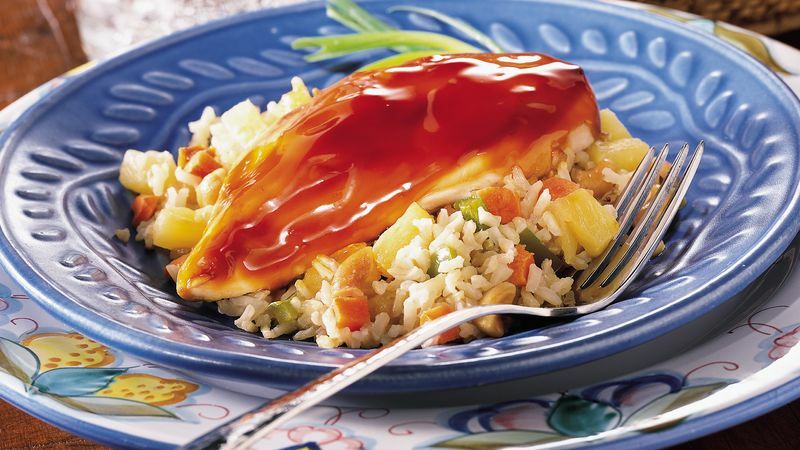 Return to oven; bake, uncovered, an additional 30 to 40 minutes or until chicken is fork-tender, its juices run clear, and rice is tender. Brown rice is a whole-grain rice with only the outer husk removed. As a result, brown rice has a wonderful nutty flavor and chewy texture. This also means brown rice takes a little longer to cook than does white rice. Store brown rice sealed in an airtight container in the pantry for up to six months. Bone-in chicken breasts can be used in place of the boneless chicken breasts. Cook them an additional 5 to 10 minutes. Brown rice is higher in fiber and B vitamins than white rice. Multi-grain rolls, sparkling water and hot green tea complete the meal.